Thanks for that. somehow I totaly managed to miss it. I have direct access to audience metrics for several small newspaper sites, and I talk enough with other site managers and small- and mid-sized to know that the Harvard report is bunk. It flat-lined for about a year, but a few months ago, started climbing again. BTW: I'm not endorsing the NAA reports. I have my own questions about those. I'm just saying whomever was involved in the Harvard story was smoking beans. 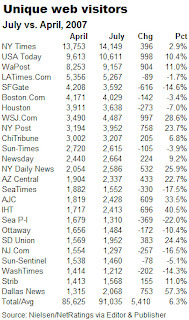 The Newspaper Association of America's own data indicates that web traffic to newspapers has been more or less flat for two years. They can't all be gaining audience if the industry as a whole has a flat traffic pattern. And who are the big winners? Our data, and that of every other data service of which I am aware, indicate that a few sites, such as nytimes.com, are getting the lion's share. Sure, with more than a thousand newspaper web sites, it is possible to cite other newspapers that are gaining traffic. But we were not interested in selecting data to fit a thesis. We selected the newspapers first, and then investigated their traffic. I wish it were different. Local media are a bedrook of community democracy. Newspapers across the country are hurting--losing circulation and laying off journalists. Some in the business can put a spin on the trends, but, if others believe them, they will end up delaying the adjustments necessary if local papers are to thrive in the Internet age. In any event, time will tell who's analysis is correct. And that was the point of the research piece, as a careful reader would have discerned. We carefully described our methodology and encouraged others to follow up with research of their own, now and in the future. The news business is changing, and we need to know in what ways it's changing, and what might be done in response. I'm puzzled by the figures in the table. What exactly is the unit being reported? I see the title of the table is "Unique Visitors" and the data columns are for specific months, but is that TOTAL unique visitors over each ~30 day period or is it a DAILY AVERAGE of unique visitors? The chart above measures the total number of unique visitors to a site in each month. If you visit a site once during month, you count as one unique visitor. If you visit the site every day in a month, you still count as only one unique visitor.